Is Print Dead Or Has It Evolved? Home / Blog / Is Print Dead Or Has It Evolved? Years after being given the ‘eternal rest’ forecast, print is not only still around, it’s growing. So what’s really going on? The debate of print vs. digital has been going on for the last decade. Unfortunately, the debate has until now been largely one-sided. While nobody can deny the kind of disruption digital content wreaked on traditional print media, it’s easy to forget that hardly a handful of publishers opted for digital-only versions, most of which are no longer still around. And that’s the crux of what’s essentially wrong with this debate—the premise that print must somehow compete with digital. Admittedly, print cannot sustain itself if the sole purpose is to compare its direct long-term revenue potential to that of digital. The model has changed substantially since the days of newsstand sales. It’s now print+digital and almost every known successful publication is in on it. Publishers who’ve adopted this “multi-channel” approach, such as The New York Times, the WSJ and The Atlantic opted to reduce, but successfully keep alive their print publications, seeing a vast long-term benefit in doing so. The Association of Magazine Media reported that multi-platform magazines have a much higher impact on sales when households have both print and digital platforms as options. Print feels real. A study by Millward Brown compared test subject responses to virtual vs. print campaigns. The study revealed that when compared to virtual stimuli, “physical material stimulate both sight and touch,” leaving a deeper footprint in the brain. This makes print feel more authentic to users as compared to digital content. At a time when companies are scrambling to appear ‘real’, this has great bearing on their efforts. Print is a powerful signal of credibility. A company that can afford to distribute printed content is unlikely to cut corners on quality. This, coupled with the fact that the onus of finding high-quality online content lies almost entirely with the consumer, further enhances the trustworthiness of printed content. It also signals to consumers and competitors that the company is willing to commit its brand to ideas and opinions bereft of the cloak of cyber anonymity. Print is present. 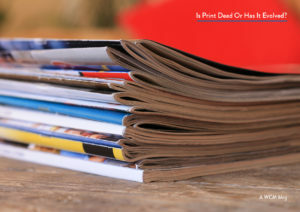 A magazine, a newsletter or ad card is present and differentiated, even in a pile. It occupies physical space and stays in the house, office or waiting room for longer, picked up multiple times and passed around. The Millward Brown study further shows that print material involves greater emotional processing and engagement, a fact important for improved memory, comprehension and brand recall. Compare this to digital content which has a very short lifespan, competes with an outrageous number of other sources and is forgotten in minutes, sometimes seconds, as in the case of Twitter. Print is visible at once to everyone around—imagine newspapers and advertisements in a subway car. The top 25 print magazines reach more adults than the top 25 primetime TV shows. Digital content is for private consumption on a private device, for one set of eyes each time. This inherent property has strong implications for brand success. And brands have been quick on the uptake. Building credibility goes a long way in the cutthroat competitive environment, and as target audiences become more niche, appealing to and keeping them loyal is of paramount importance. So, what’s the value of print in the digital age? Print vs. Digital has always been a misguided conjecture. The more pertinent, and perhaps fundamental, question is this: What really is print in the digital age? Printed content lives everywhere around us—on the boxes of products we buy, on life-sized billboards on the streets, on the very keyboard we use to type digital content. What we must understand is that print is a powerful source of direct revenue and influence in the digital age. But print lives on, as a powerful and convincing tool that brands, marketers and leaders use all the time to sway opinion, to make a change and to inform the public. We have moved beyond print vs. digital and now are harnessing the print+digital model.